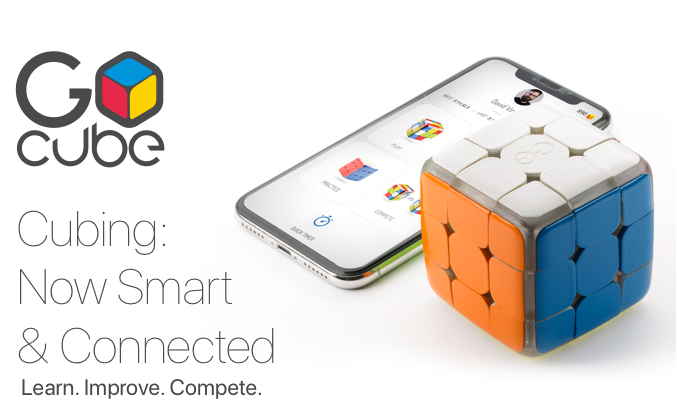 It’s Follow-Up Friday: Rubik’s Race edition! And today, I’d like to return to the subject of Rubik’s Cubes! 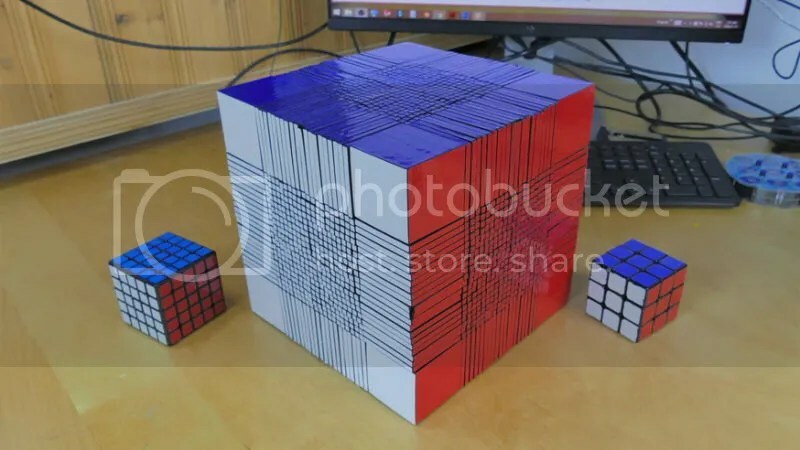 You know, every time I think I’ve seen it all when it comes to Rubik’s Cube, some enterprising solver proves me wrong yet again. 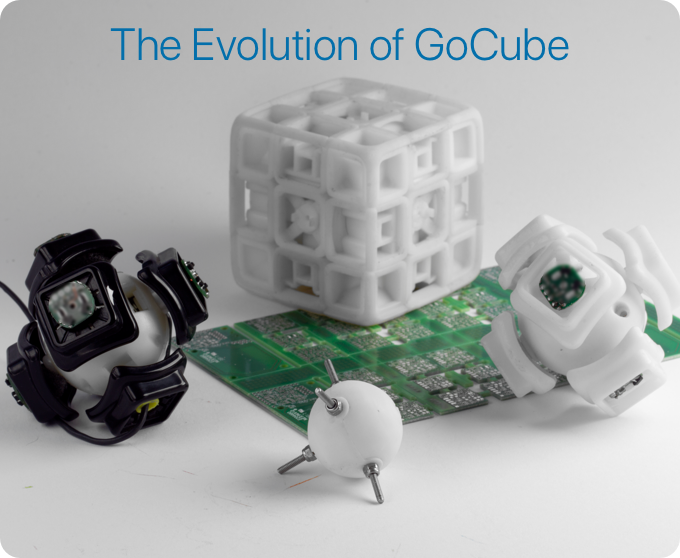 I mean, in writing three blog posts a week here for years, I’ve seen a LOT of cool things done with Rubik’s Cubes. 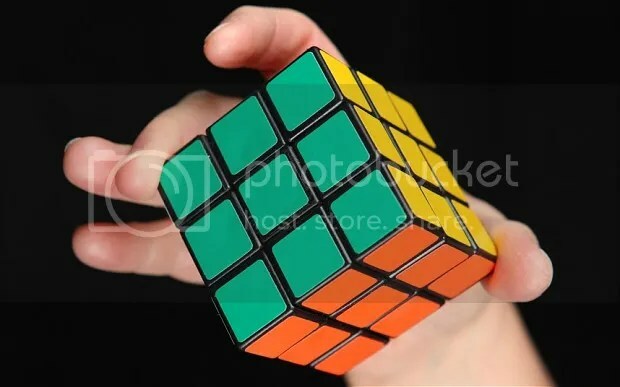 I’ve seen the world’s largest Rubik’s-style cube being solved, a building turned into a solvable Rubik’s Cube, a new speed-solving world record of 5.25 seconds, and a Rubik’s Cube solved one move at a time by strangers across the globe. And now, we’ve got our first cross-disciple Rubik’s race. Anthony Brooks, a Rubik’s speed solver, pitted his twisty puzzle skills against the speed of Usain Bolt from his 9.81 second run in the 100 meters at this year’s Summer Olympics. When it comes to strategy puzzle games, no matter how complex or how simple the actual game mechanics, the game itself hinges on the two players involved. After all, two extremely tactical puzzlers can make checkers look like chess. Now, imagine a game that combines the pattern-matching of Uno, the strategy of chess, and the mechanics of Upwords, and adds a scoring element to boot. It might sound complicated, but I promise, it’s as simple as checkers. 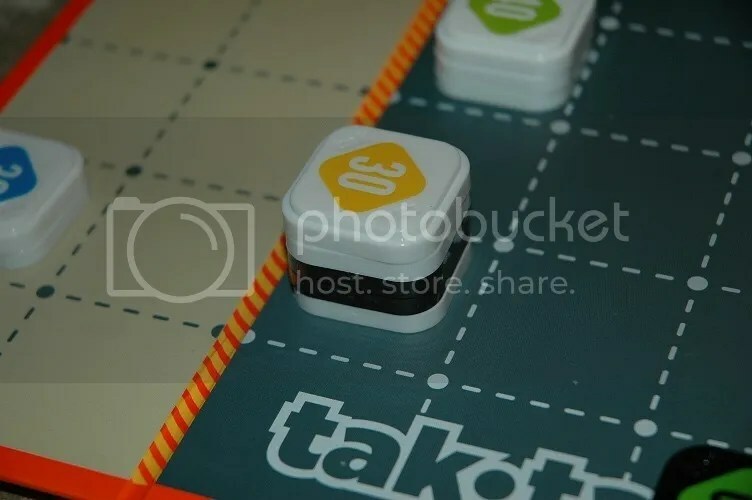 Tak•tak is a two-player strategy scoring game designed by the folks at Twizmo Games, and it’s another puzzle game brought to life thanks to a successful crowdfunding campaign. 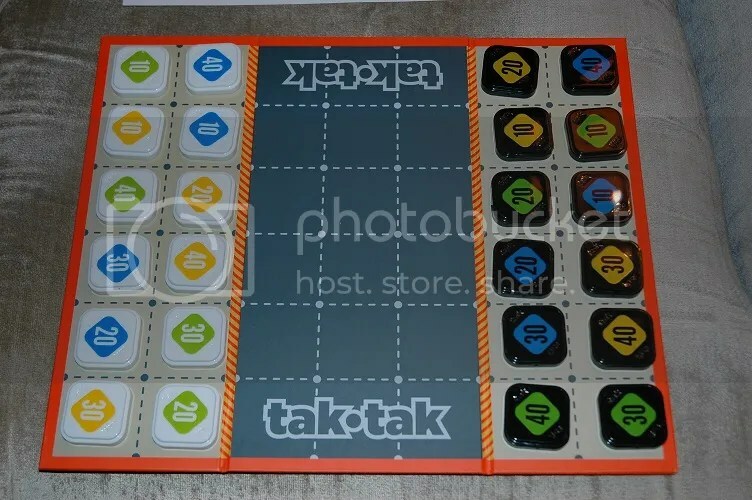 Although Twizmo Games is best known for twisty puzzles (or Rubik’s Cube-style puzzles), they’ve taken a strong step into the traditional board game market with Tak•tak. Each player starts with 12 tiles, each tile bearing a different score (10, 20, 30, or 40) and a different color (green, blue, or yellow). The two rows nearest the player form that player’s safe zone. The three rows in the middle are the war zone. Your goal is to get as many points as possible into your opponent’s safe zone by stacking your tiles, crossing the war zone, and either capturing or maneuvering around your opponent’s tiles. You can only move forward (either straight or diagonally), so this is a game about tactics and initiative. The game ends when one player has no more available moves. (There are other ways to end the game if you choose to use the advanced game play rules, but we’ll stick with the basic rules for now.) And then it’s time to count your tiles. You earn points for all of the tiles you’ve moved into your opponent’s safe zone (including any of your opponent’s tiles that are in stacks you control), plus points for any tiles your opponent never moved into the war zone. (Meaning they were never “in play.”) Highest score wins! 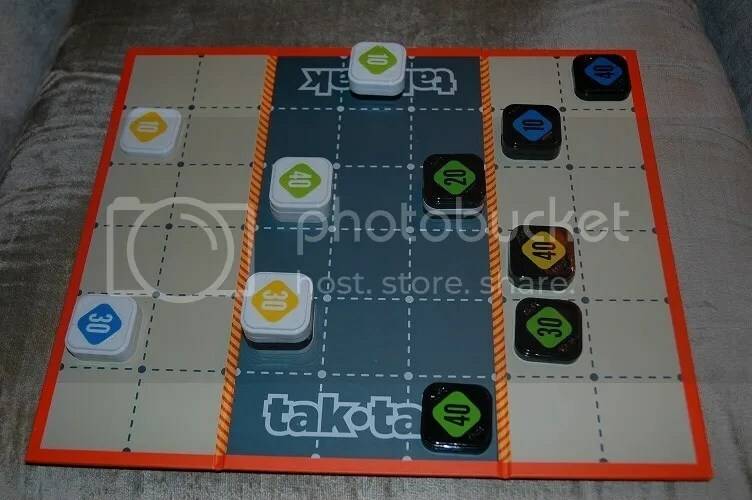 Tak•tak builds a lot of versatility and play possibilities into a game with checkers-simple mechanics, and the more you play, the more fun it is to delve deeper into tactics and strategy. It was worth losing 50 points for keeping a few tiles in my safe zone when they prevented a stack of my opponent’s tiles from scoring. 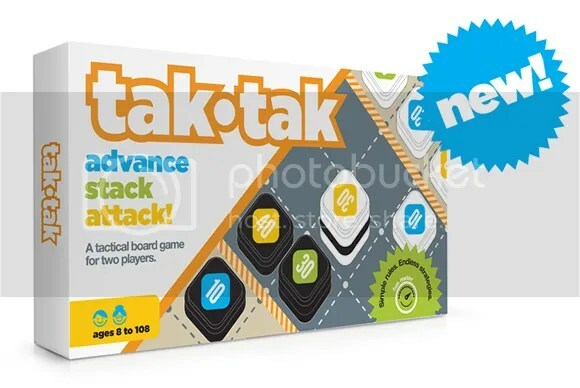 The clever mix of classic game-play elements not only makes Tak•tak so easy to dive into, but also ensures new players can more time actively playing and less time worrying about learning the rules (a common downfall for more complicated strategy games). The designers claim the game is appropriate for ages 8 through 108, and I think they’re right on the money.